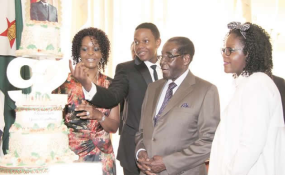 Good Ol' days - The Mugabe family celebrates Robert Mugabe's 92nd birthday (file photo). The Zanu-PF Youth League will today mark National Youth Day with various activities to commemorate former President Robert Gabriel Mugabe's contribution to the liberation and development of the country. This was said by Zanu-PF secretary for Youth Affairs Cde Pupurai Togarepi in an interview on the sidelines of an ongoing ideological training workshop for students held in conjunction with the Zimbabwe Congress of Students Union at the University of Zimbabwe yesterday. "Tomorrow is going to be Youth Day, so youth will be doing charity work and will be associating with each other, discussing development issues, issues that challenge them and we are also going to have time to interact with these students tomorrow and reflect on this training they have gone through," he said. "We are going to be listening to the youths, they have their own issues they want to convey to the leadership of the party and we will give them a platform to talk to the leadership. That time of us going to rallies is gone, our new dispensation is going to be interactive, so tomorrow is going to be the starting point for us." Cde Togarepi described Cde Mugabe as a hero who had done a lot for the country's development, adding that a youth delegation is expected to visit the former President at his home today. "He is our hero, he is our icon," he said. "He is somebody who has contributed to the development of this country immensely. "So, this day came about recognising him as our leader and what he has done for this country. "So you cannot celebrate the Youth Day without including Robert Mugabe in the process, so we are going to celebrate with him in mind and where possible some of our youths will be going there to sing happy birthday with him. Toenda ne ma bhosvo ikoko kunocelebrata nemukuru wedu, tinomuda." Meanwhile, Zimbabwe Service Commissions chairman Dr Mariyawanda Nzuwah has confirmed that today is a public holiday with respect to public officers as gazetted by President Mnangagwa on November 24 in Statutory Instrument Number 143 of 2017. "Accordingly, Wednesday, 21st February is a Public Holiday with respect to public officers," Dr Nzuwah said. He said all public officers were expected to work the whole day yesterday and report for duty tomorrow, adding any violation of office hours would be considered an act of misconduct. Calls for former President Mugabe's birthday to be made a national holiday were adopted by Government in August last year, following intense lobbying by the Zanu-PF Youth League. The day coincides with the 21st February Movement celebrations meant to commemorate the principles and ideals that former President Mugabe stood for. The 21st February Movement was formed in 1986. Speaking during his acceptance speech at his inauguration as the second Executive President of Zimbabwe last year, President Mnangagwa indicated that the former President needed to be accorded the respect and recognition he deserved as one of the founders and leaders of Zimbabwe.